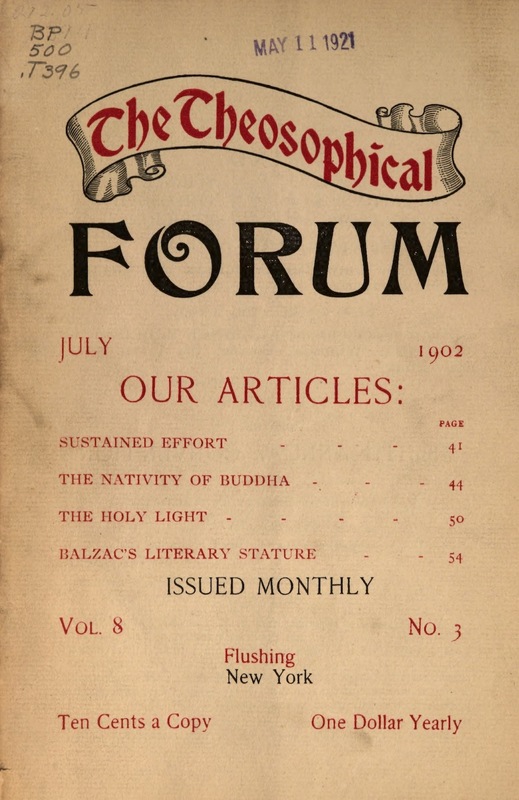 Official magazine of the Theosophical Society. New York, NY. Publisher: American Section of the Theosophical Society / Theosophical Society in America. Corporate author: Theosophical Society in America1/1, April 1889-10/12, April 1905. 16 pp. The journal was originally started by W.Q. Judge. In May 1895, with the sundering of the Theosophical Society and the withdrawal of the American Section, the journal began a new series and started its numbering over at 1/1. A journal under the same name was started again in Point Loma, California, in 1929 by G. de Purucker, the successor of Katherine Tingley. Noted in “List of Advance Thought Publications,” The New Cycle, March 1900, 159-60. Reprinted: Edmonton Theosophical Society, Alberta, Canada, 1993, 7 vols. with 1903. LOC; NYPL; University of California, San Diego; Harvard University; University of Michigan; Brigham Young University; McMaster University.